Editor/Author Dutton, Richard and Howard, Jean E.
This Companion to Shakespeare's Works offers a uniquely comprehensive snapshot of current Shakespeare criticism. Brings together new essays from a mixture of younger and more established scholars from around the world - Australia, Canada, France, New Zealand, the United Kingdom, and the United States. Examines each of Shakespeare's plays and major poems, using all the resources of contemporary criticism, from performance studies to feminist, historicist, and textual analysis. articles are available in work types from the histories, the tragedies, the romantic comedies, and the late plays, problem plays and poems. Contained are individual essays on all texts in the relevant category, as well as more general essays looking at critical issues and approaches more widely relevant to the genre. Offers a provocative roadmap to Shakespeare studies at the dawning of the twenty-first century. 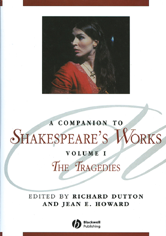 This companion to Shakespeare's tragedies contains original essays on every tragedy from Titus Andronicus to Coriolanus as well as additional essays on such topics as Shakespeare's Roman tragedies, Shakespeare's tragedies on film, Shakespeare's tragedies of love, Hamlet in performance, and tragic emotion in Shakespeare.